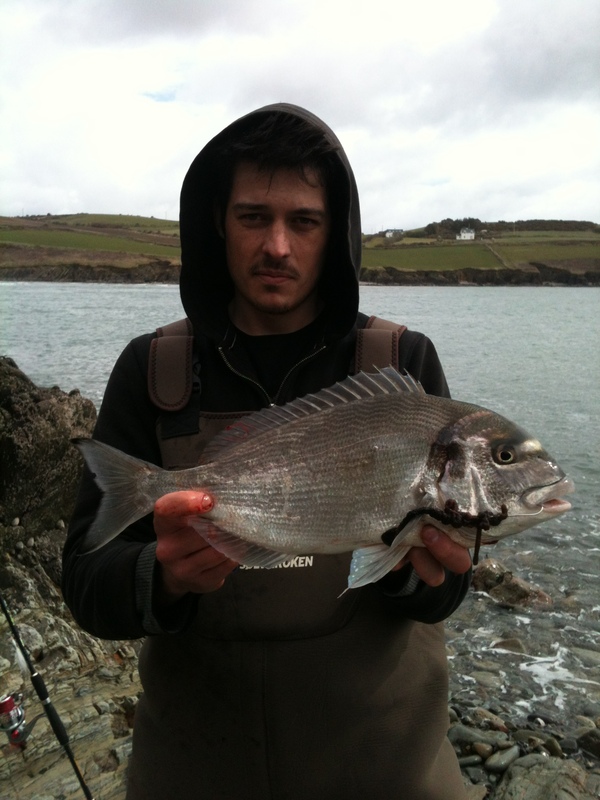 I remember the first time I caught a Gilthead Bream (Sparus aurata). It was an overcast day with an offshore breeze at my local estuary mouth. The tide was coming in and the water was slightly coloured after the previous days blow. 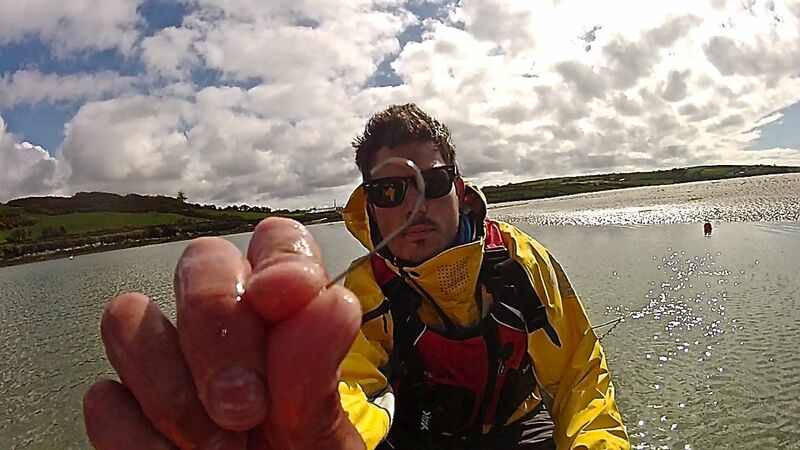 There was a good swell running which pushes across the mark we fish as the tide comes in. 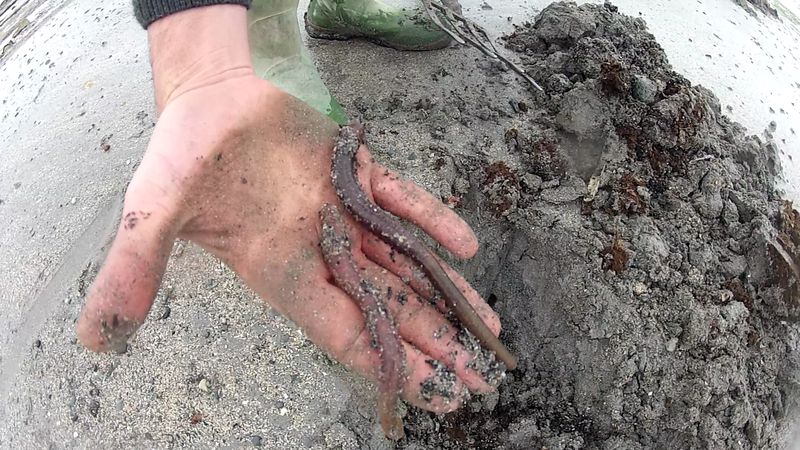 The tide was halfway in, I was using half a big peeler for bait and fishing this just over the main channel on a sand bank. We were targeting bass. I saw the knock of the tip and struck into a fish. Immediately I thought it was a decent bass as it has solid head shakes and headed up the channel. Once I bought it up it was something unexpected, a Gilthead Bream. That was possibly seven years ago. I caught a number of Giltheads from the shore over the next few years and after getting into kayak fishing it was one species I wanted to actively target. The Gilthead bream is part the bream family Sparidae which also comprises of a number of variations of the bream types. The Gilthead is a Mediterranean fish species but in recent years has been becoming more and more frequent in Irish waters. Before, a Gilthead would be a surprise catch but can now be specifically targeted due to increased numbers and anglers becoming more in tune with marks the bream return to. The Gilthead can be identified by its broad wide body, silver colouring and its distinguishing bar that runs across its forehead between the eyes. The gilthead has a mouth full of molar type teeth which are used for its diet of shellfish and crustaceans and of course breaking the hooks that are not up for the job of landing one of these brutes. According to the Irish Specimen Fish Committee 2013 the Specimen Weight is 1.4 kg (3.08 lbs). I have caught Gilthead bream in various locations and have also read about catches of Giltheads at places I have never fished before. I have caught them on surf beaches, estuaries and even lagoons where the salinity levels are virtually non-existent. I have been fortunate enough to find some marks myself that produce these fish while I have also been taught by locals who I have fished with. Having this insight I was always confident in targeting Giltheads from the Kayak. The time of year from personal experiences varies with the weather conditions of the particular months. I have caught Giltheads in March and have caught them in November. As the water temperatures rise the Giltheads move into their shallower areas. The warmer summer months produce the most catches of Gilthead. 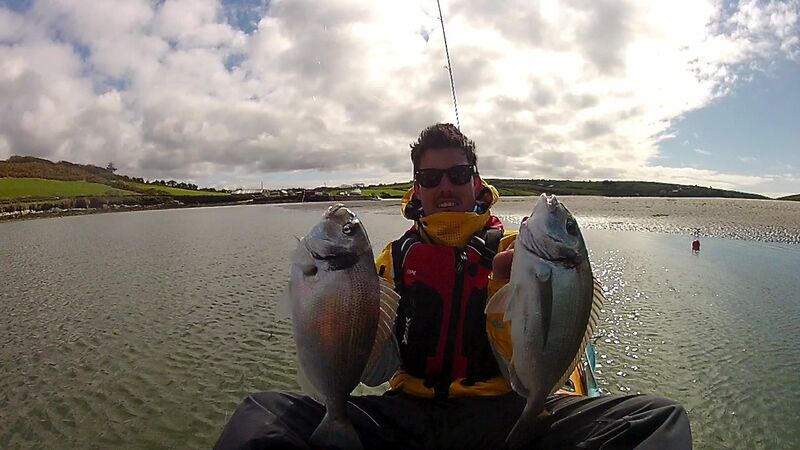 A warm sunny day in an estuary I find enhances catch rates as the bream tend to feed a lot better and are more aggressive. Now, once again, I have caught them in the total opposite weather conditions but sunny would be preference for estuary fishing and overcast for beaches. Tides play a vital role in selecting the location for targeting Giltheads. If fishing in a strong tidal estuary it best to fish these areas on the neap stages of the tide cycle. This will give a longer time frame the area may be fished before the tidal surge becomes too overwhelming to fish. If fishing a beach area, spring tides are very good and with little or no tidal factor the whole tide may be fished. I find the best times to fish are just as the tide turns to come in and just as it turns to run out. The Giltheads seem to be the first fish on the scene at the change of the tides. The kayak setup for catching Giltheads is very simple. An anchor is a must as I want to hold my position to get the bream as they pass you in the estuary. These fish will travel a long way up an estuary feeding so I pick a spot and am patient. The bream will travel in shallow water from experience. I anchor my kayak with the anchor out the back on my trolley (Here is a link to my Kayak Anchor Trolley Setup) so my two rods will sit out in front of me and my kayak sits still with the tide and my baits casted away from the kayak. Rigs for Giltheads need not be over complicated and the simpler the better. There is no need for bells and whistles for your rigs. I use two different traces for Giltheads from the Kayak which can be seen below. Using the smallest lead possible will allow less resistance to be felt by the fish when they take the bait. A trace line of 12lb I find is sufficient and using Fluorocarbon reduces the visibility of the trace. Hooks all come down to personal preference and for me I do not go bigger than a 2/0 hook and most of the time a 1/0 is used. It depends on the bait I am using and how big the fish are in the area. A word of advice is to use a strong hook. My father has had a 1/0 hook completely broken by a Gilthead. 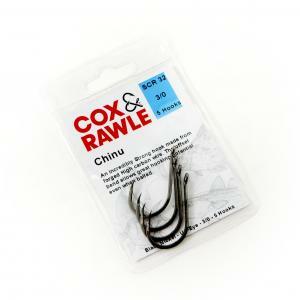 The hooks shown below by Cox & Rawle are very strong and the hook gape is wide enough for peeler crab baits. Bait for Gilthead Bream is of high importance. I dig my own fresh lugworm and gather peeler crabs. These are the only two baits I use for Giltheads as they have worked time and time for me. I will write up on bait collecting in future posts. The best advice I can pass on is to have bait the freshest that is possible. It provides more confidence and I was always taught that your confidence plays a major role in your fishing success. I keep the presentation of my bait simple. 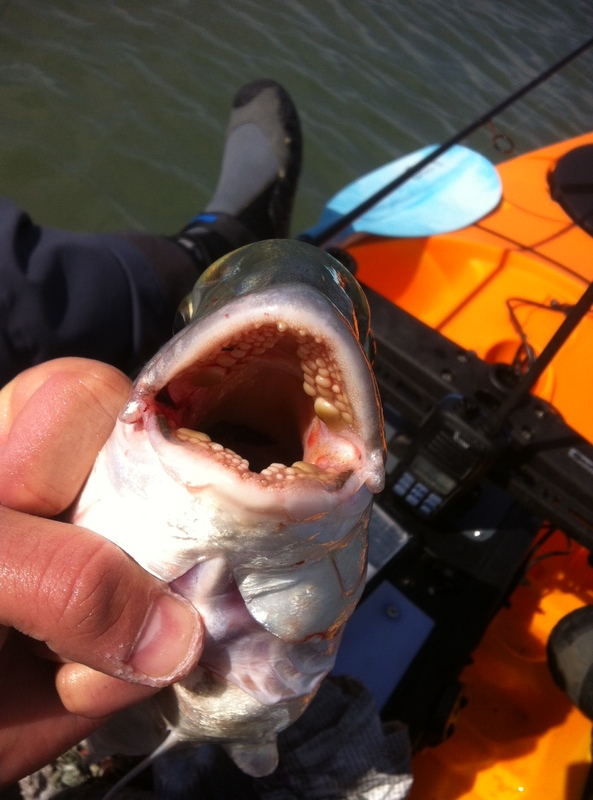 As I previously discussed the anchoring of my kayak, the next step is fishing for the Giltheads. Once anchored I bait up one rod and cast it out in one particular area and then bait up and cast in another area. If I am fishing a tidal estuary, the kayak will sit nice and straight with the current and allow the main line to be kept in contact with the trace so any bite can be seen. I keep an eye on the rod. The Giltheads will either bite in two vastly different ways. One way will be a subtle knock knock almost like a small fish is investigating. In this case I pick the rod up and wait till I feel a decisive take and set the hook. The other scenario will be the Gilthead having no second thoughts about taking the bait and the rod just doubles over without warning. They are strong and I would not be surprised if a rod would be pulled overboard in milliseconds. I try be patient and not be disheartened by a lack of activity as that may turn around and I could have the best half an hour of fishing I ever had as a big group of bream pass by. These fish are strong and fighting the fish is the most exciting part about it. They have powerful had shakes and long runs. They will not give up easy. Although being very tough and strong I use two spinning rods off the kayak for them as it makes the fight all that much better. The reels are loaded with 12lb braid which sends their head shakes through the body due to the little stretch design of the braid. I don’t force the bream as a weaker hook will get damaged and chances are they will come off. 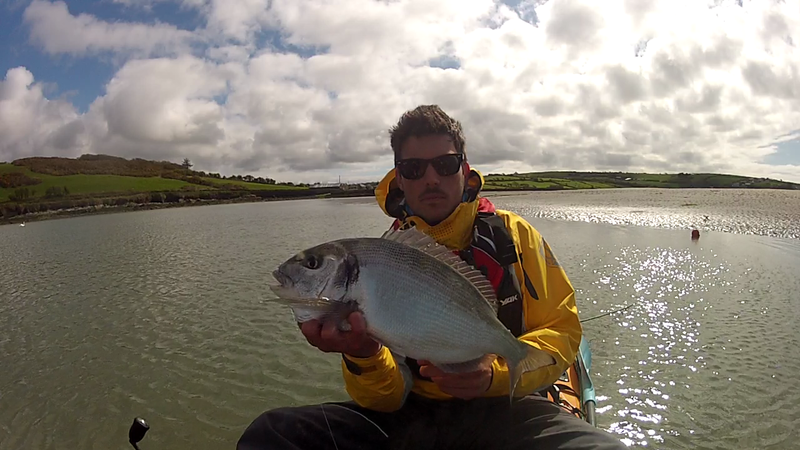 When landing the bream I handle with caution as they are covered in sharp fins. 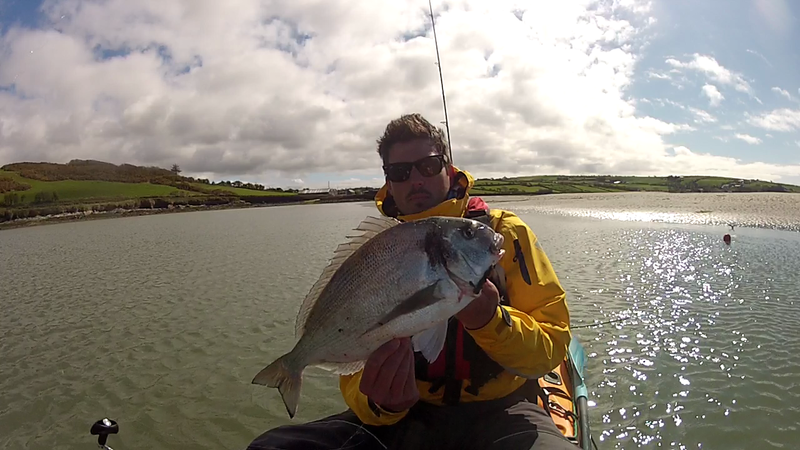 This entry was posted in Kayak, Shore fishing and tagged gilthead bream, Ian Burton, lug.crab. Bookmark the permalink. Was there not a larger one caught near Dingle last year or am I dreaming, 5lb ish. A great read had me packing my gear to go for them.